I generated two different conjugated bases. The book indicates the red proton is the more acidic proton. Is this the proper resonance structure for the red proton's conjugate base? If so, then this explains why the red proton is more acidic, because it has a delocalized pair of electrons, while the blue proton does not have a delocalized pair of electrons. Figure c does not look like a real compound. If it represents the conjugate base of cyclopentadiene, it is lacking a negative sign, and all five protons around the ring are equivalent, so the question of whether the red or blue proton is more acidic makes no sense. If Figure c represents cyclopentadiene, the acid, it does not clearly show that the red position really has 2 hydrogens. 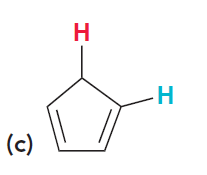 However, the double bond structure shown is consistent with 2 hydrogens in the red position, and the question becomes very simple: in cyclopentadiene, is a methylene proton or a vinylic proton more acidic? Removing a vinylic proton puts a negative charge in the localized sigma system - no aromaticity develops. However, removing one of the methylene protons causes that carbon to go from sp3 to sp2p, and the negative charge goes into the pi system where it can be delocalized over the 5-membered ring. And aromaticity is a characteristic feature of cyclopentadienide ion. More is involved here than just resonance structure. When you have pi electrons delocalized around a single ring there is the $4n+2$ rule where the most stable configuration of pi electrons in a ring has $4n+2$ delocalized electrons. A planar, conjugated ring with the proper $4n+2$ number of pi electrons is aromatic and will be strongly stabilized. If instead, you have $4n$ delocalized electrons it doesn't work, and especially for smaller rings you may end up with something highly unstable. 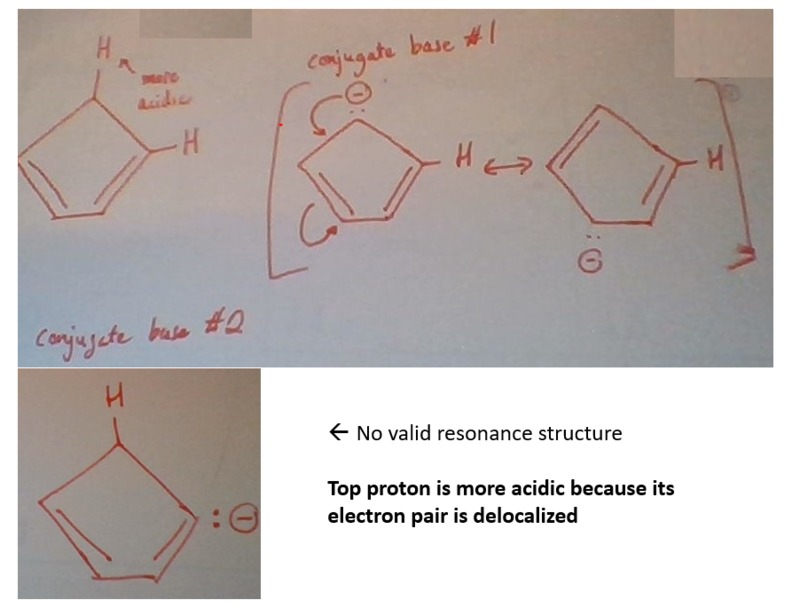 When you draw the resonance structures by removing the red proton, you count six delocalized pi electrons -- $4n+2$. So you get that highly stabilized aromatic ring. That's why the red proton is a relatively strong acid. 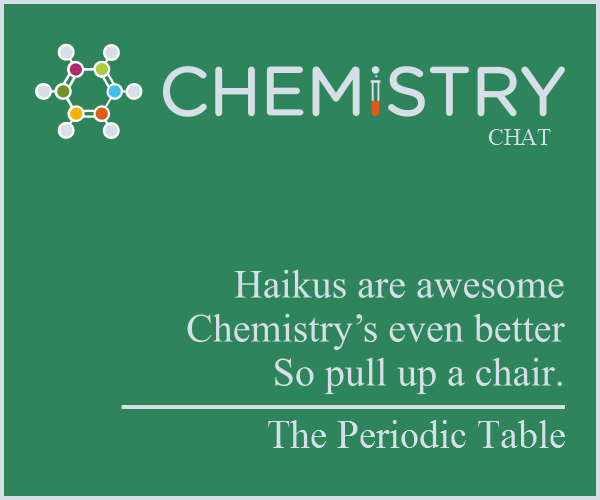 Bonus questions: 1) Would it work if you used cyclopropene instead of cyclopentadiene? 2) What if you had 3-chlorocyclopropene instead and you used a Lewis acid to remove a chloride ion(see slides 30 and 31)? When is a molecule with fluorine considered more acidic than one with chlorine? Reaction of HBr + 2,4-dimethylpent-1,3-diene yields 3 products?